Last week was ugly on FanDuel. No other way to put it. 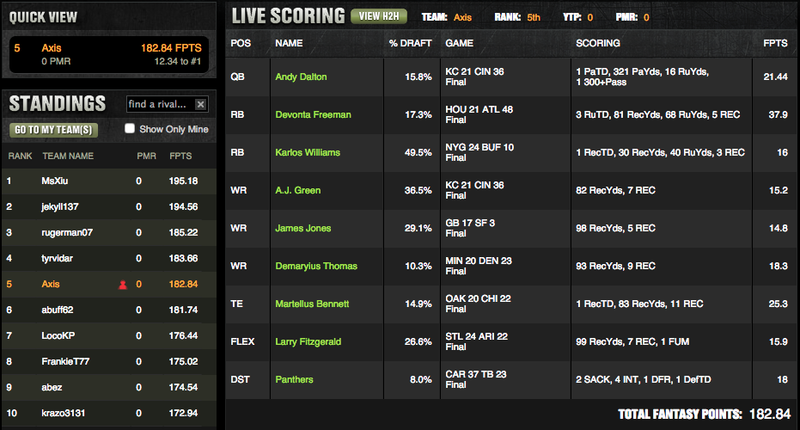 I was lucky enough to make a big score in my Draftkings GPP though still giving a positive week (5th place, see below). Moving on to this week I’m skipping Thursday slates because there is a fair amount of injury news I’d like to wait to hear about. So, with that in mind below is the current roster I’m working with but be sure to check back in before LU lock on Sunday because some players may change! I made a few changed with all of the injury news coming out and decided on a pretty safe lineup. Rivers is facing a really bad Steelers pass defense and should have no problem getting to 20 points. I’m sticking with Charles for all the reasons below and I’m rolling Dion Lewis. He is the Pats go-to RB and their offense is on a roll. I think he finds the end zone and 85+ yards. I’m also sticking with Edelman and adding Fitzgerald and Matthews. Fitz is a target machine for Palmer facing a poor Lions defense and Matthews should be in a high scoring, fast paced game and he’s getting close to 9 targets a game. Charles Clay is Taylor’s #1 target and for $5700 I’ll take that. Since I’m not playing Gronk I need another TE who I know will have targets and get red zone chances. Yes, I’m rolling Matt Stafford. His price has dropped low enough where he should be able to hit his minimum value and he has a high ceiling. He’s talented and has weapons Detroit has just been inconsistent this season. They should be in a tight game if not trailing most of it so Stafford should see his usual 40-50 pass attempts. I’m almost 100% sure I’m playing Charles no matter what this week. He’s my top rated RB facing Chicago and he is in line to get 20+ touches. The Chiefs are a huge favorite and should have no problem putting away the Bears. I think Jamaal is staring at 20+ fantasy points. Currently I’m rolling Freeman. I’m waiting for new from Buffalo on their RB situation because I’d like to use whoever the Bills are going to give the bulk of the carries to but I can’t be sure of who that is at the moment. Freeman is a solid play if Coleman remains out. Falcons should be leading this game and Freeman is integrated into the passing attack as well. Julian Edelman is a must play for me right now. He is a target machine and a high floor/high ceiling player for less than 8k. The Patriots offense has shown they will not slow down. Lock him in. I’m also going after Cobb. He’s in a great offense projected to score near 30 points and he’s getting 9 targets a game. He’s a big play WR with the best QB in football; I like that for 8.2k. Kendall Wright is a value pick but also a solid pick. Mariota has been solid and the Bills secondary has been giving up a lot of passing yards. At Nate’s price he should be able to hit his value and then some. Witten isn’t my top TE choice but I think he’s solid for the price and matchup. New England struggles guarding TEs and Witten is getting seven targets/game. He’s a safety net for Weeden and I think he see 10+ targets in game where Dallas may be passing a lot. K/DST I will remain open on. Currently I just have the cheapest K and and cheap DST. I like the Jags though because they can put pressure on the QB and Winston is very turnover prone. Again, be sure to check back in before lineup lock on Sunday because players could change as injury news and starter information comes out. 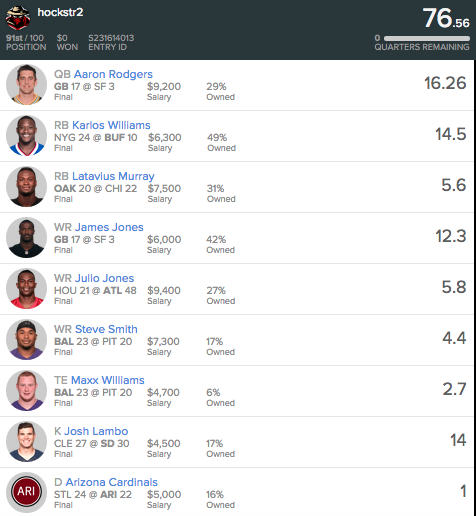 Do you usually roll with this lineup in Draft Kings and Fan Duel or do you switch it up for Draft Kings? Typically I try to match both sites, but really that is dictated by price. Some players are just better deals on some sites than others. Also on DK, I primarily play GPPs because I like there tournament structure, size, and payout more than FDs.